Alejandro Aguilera graduated from Provincial School of Fine Arts in Holguín in 1983 and the Superior Institute of Art in Havana in 1989. In 1990, he attended a fellowship at the Massachusetts College of Art in Boston. Aguilera is one of the sculptors who contributed most to the artistic changes that took place in Cuba in the 1980s, and participated on the Castillo de la Fuerza Project in Havana in 1989. Some of his solo exhibitions include About the Modern Spirit (High Museum of Art, Atlanta, Georgia, 2012); Black Drawings (Saltworks Gallery, Atlanta, Georgia, 2011); A Brief History of Usage (Bernice Steinbaum Gallery, Miami, Florida, 2007); Forty Yards of Lines (Georgia College and State University, Milledgeville, Georgia, 2006); The Art of Making Art (Ty Stokes Gallery, Atlanta, Georgia, 2004); and Everyday Objects (Ramis Barquet Gallery, Monterrey, Mexico, 2002). 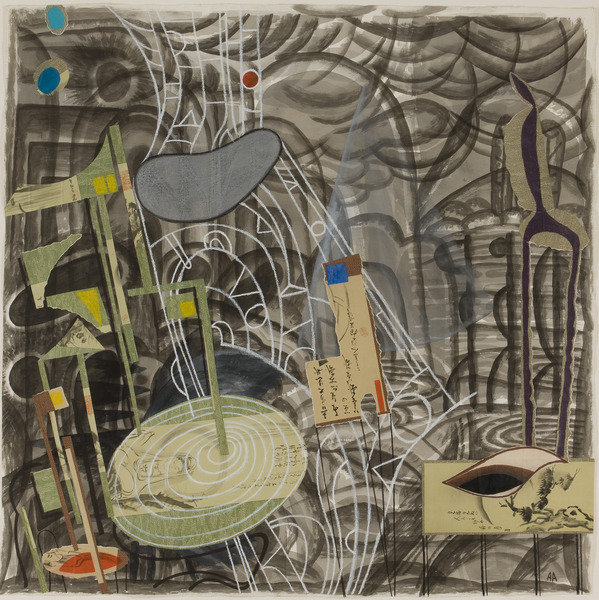 His works are part of the collections of important institutions, such as the National Museum of Fine Arts and the National Council for the Arts, both in Havana; the High Museum of Art in Atlanta, Georgia; the Museum of Contemporary Art (MARCO) in Monterrey, Mexico; the Fort Lauderdale Museum of Art, Fort Lauderdale, Florida; the Ludwig Forum für Internationale Kunst, Aachen, Germany; and the Fulton County Arts Council in Atlanta, Georgia. Black Drawing (The Virgin Girl), 2005. Watercolor and ink on canvas. 37 x 27 in. Caridad (Charity), 2001. Ink on paper. 44 1/2 x 44 1/2 in. Travelandscape, 2004. Collage, ink and crayon on paper. 44 1/2 x 44 1/2 in. Black Drawing (Homage to Bill Traylor), 2005. Crayon, collage, ink and acrylic on paper. 41 3/4 x 106 1/4 in. Black Drawing (Still Life), 1999. Crayon on paper. 30 x 22 1/4 in. Aurelio (Life After Death), 2009. Collage, acrylic and crayon on paper. 45 x 66 1/2 in. El Che y Carlos Santana (Che and Carlos Santana), 2006. Graphite, paper, glass, acrylic, metal, denim, Georgia clay and polychromed wood. 88 3/4 x 25 x 18 in. Caridad (Charity), 2007. Polychrome wood, metal, glass and fabric. 91 1/2 x 44 x 13 in. Caridad (Lo que allí sucedió) (Charity(What Happened There)), 2008. Acrylic and collage of paper on metal, 36 x 24 in. Durante la primera deportación. Madrid, 1871 (During the First Deportation. Madrid, 1871), 1991. Cow blood and pencil on paper. 27 1/2 x 19 1/2 in. En Cayo Hueso, Estado de la Florida, 1894 (In Key West, Florida State, 1894), 1991. Cow blood and pencil on paper. 27 1/2 x 19 1/2 in. Monument to the Unknown Soldier, 1995. Polychrome wood and metal. 95 x 20 x 20 in. La fortaleza maldita (The Cursed Fortress), 1992. Polychrome wood, graphite and metal. 36 x 74 1/2 x 14 in. Restos mortales (Remains), 1994. Polychrome wood, metal, paint and fabric. 51 x 51 x 10 in. Life After Death (E. Fernandez), 2013. Ink, coffee and crayon on paper. 51 1/2 x 71 1/2 in. Black Drawings Series (Black and Gold Gallery Walk), 2013. Coffee, ink and acrylic on paper. 59 1/4 x 51 1/2 in. Black Drawing Series (Diego and Frida Unemployment Dance), 2013. Coffee, ink and collage on paper. 39 3/4 x 32 1/4 in. The Walker and His Shadow, 2006. Wood, metal, roof tiles, cardboard, nails and wire. 81 1/4 x 30 13/16 x 12 in.